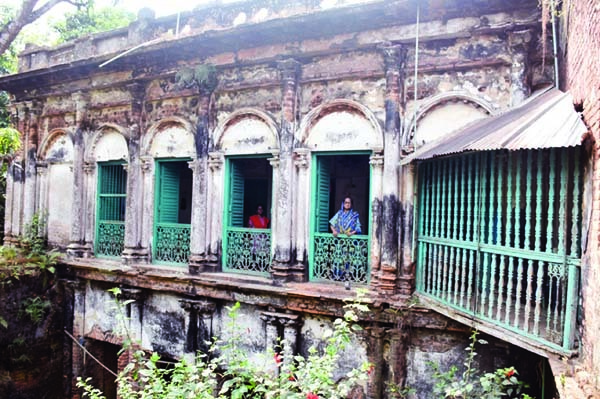 BARISHAL: A view of the house of Freedom Fighter Shri Kumud Bandhu Roy Chowdhury at Bakerganj Upazila in the district. The house and properties of Liberation War witness freedom fighter Shri Kumud Bandhu Roy Chowdhury - popularly known as Natubabu of Shyampur, under Bakerganj upazila of the district, needed to be immediate recovery from land grabbers and preservation as the site related with liberation war of Bangladesh. The spot was an operational headquarters during Muktijuddho and also a camp of 300 - 400 Freedom Fighters of the area. When Pak-occupation army operated in the area with in collaboration with anti-liberation-forces on November 16 of 1971, and destructed the area killing numbers of innocent people, Nantubabu with other members of the family including only five-month old son of him managed to save their lives by fleeing from the area .. However after end of liberation war, the family members returning home found the destructed property became target of local land grabbers and anti-liberation forces. Anti-liberation forces to abstain Natubabu from giving witness against the war criminals later preplanned injured him on September 28, 1973 and he succumbed to his injuries on October 10, 1973. Even after independence when the family members visited Bangabondhu in 1973, he assured to preserve the property of Natubabu and take action against the anti-liberation forces and land grabbers.